A lot of amazing things in Jeremy Mosher’s life happened thanks to Queen’s. 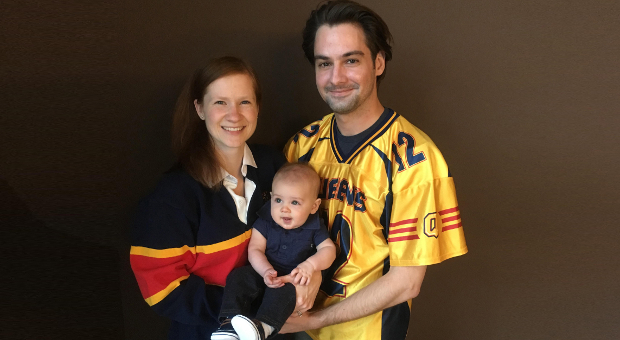 On his first day on campus, the Artsci’08 graduate met his future wife, Andrea (Hay) Mosher, Artsci’08, and his friend Conrad Fox, Sc’08, who also stood as his best man at their wedding. After graduation, it was a Queen’s connection that lead to Mr. Mosher’s first job in oil and gas equities in Calgary. When the recession hit Alberta in 2008 and Mr. Mosher lost his job, he knew he could rely on the Queen’s alumni network to find his next professional opportunity. “I love this university. I met my wife and many life-long friends when I was a student at Queen’s. I’ve experienced the power of the alumni network both personally and professionally and in my new volunteer role, I’d like to help other alumni have a similar experience,” says Mr. Mosher, who now works in Toronto for National Bank. His love for Queen’s is one of the reasons why Mr. Mosher is volunteering for the role of president of the Queen’s University Alumni Association (QUAA), succeeding the successful leadership of outgoing president Sue Bates, Artsci’91. He started his two-year term at the beginning of April and will serve as a representative of more than 155,000 alumni over the next two years. “Jeremy is an outstanding and dedicated volunteer leader, having served as our Calgary Branch President as well as holding various positions on the QUAA Board of Directors. I know Jeremy will bring his great perspective and experience as president of the QUAA,” says Ms. Bates. Mr. Mosher started volunteering with the Calgary Alumni Branch in 2008 and eventually became the Branch President, before joining the QUAA Board as director of the Alumni Volunteer Summit. The summit – which features Queen’s volunteers from around the world gathering in Kingston for a day of networking and seminars – showed Mr. Mosher that bringing the community together is a great learning opportunity. He aims to build on the cooperation he experienced at Alumni Volunteer Summit by taking steps to bring Queen’s alumni volunteers closer together so they can learn from each other. There is a big alumni volunteer community – Queen’s volunteer leaders help run nearly 50 Alumni Branches across North America and the world, and there are more than 1,350 Homecoming reunion/class giving volunteers. To learn more about Mr. Mosher, read his first QUAA President’s column in the upcoming issue of the Queen’s Alumni Review, which comes out in late May.